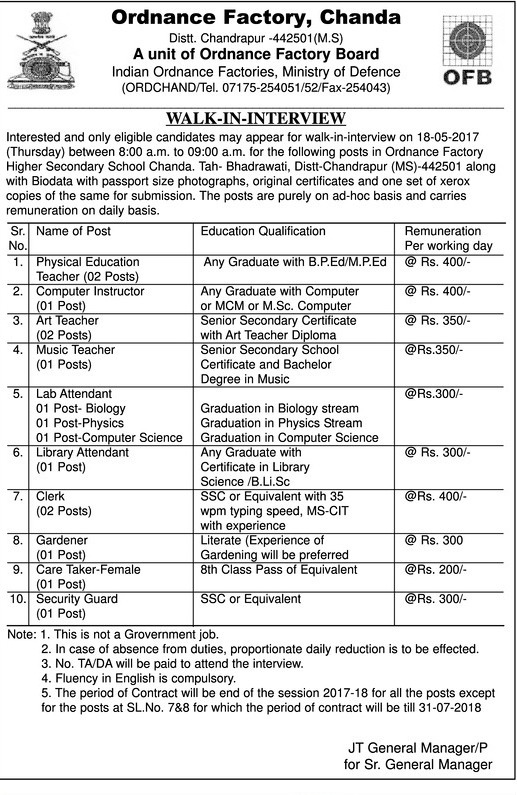 OFCHANDA (Ordnance Factory Chanda), Chandrapur Published Job Notification for 15 Physical Education Teacher and morePosts. Candidates who wish to apply must look at OFCHANDA Recruitment 2017. Eligible candidates can apply for walk-in-interview on 18-05-2017(Thursday). Education Qualification: Any Graduate with B.P.Ed/M.PEd/M.sc/Art Diploma/B.sc. For Post wise Education Details follow the detailed advertisement. Interested & Eligible candidates may attend for walk in interview along with all the documents addressed on 18-05-2017(Thursday) between 08.00 a.m to 09.00 a.m for the following post in Ordnance Factory Higher Secondary School Chanda. Tah- Bhadrawati, Distt-Chandrapur (MS)-442501. Starting Date, Last Date to Apply Offline at Ordnance Factory Chanda which candidates should be remember as follows.